Director Laura Poitras began filming WikiLeaks founder Julian Assange in 2011. Back in 2014, Laura Poitras brought out Citizenfour, her Oscar-winning documentary about Edward Snowden's revelations of the NSA's illegal surveillance program. Unfolding like a thriller, the film knew exactly what it was about — Snowden's heroism, the evils of clandestine government snooping and the virtues of making such hidden programs known. 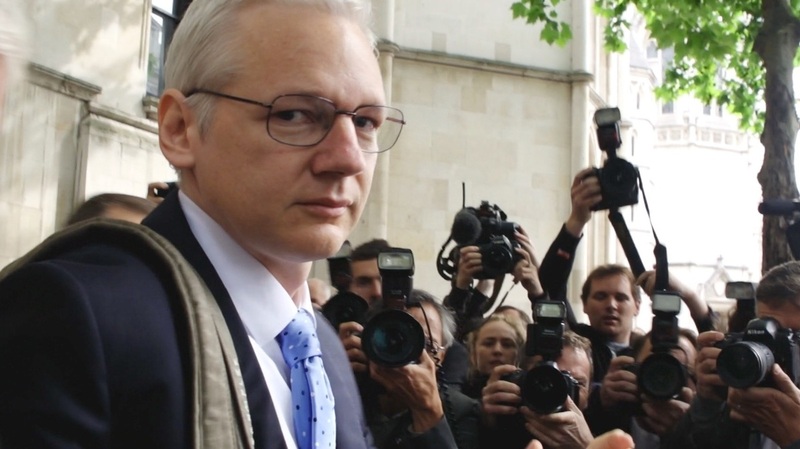 Poitras clearly expected to make a similar kind of movie when she started shooting Risk, her new film about Julian Assange, the 45-year-old Australian founder of WikiLeaks whose way of cyber-releasing classified documents radically changed journalism. Yet over the years the film began morphing into a messier, more ambiguous kind of doc. While this makes Risk less shapely and dramatic than Citizenfour, it's more interesting for that very reason. Poitras began filming Assange back in 2011 after his group released classified files from Private Chelsea Manning, then known as Bradley. She follows Assange as he lies low in the English countryside, gets accused of sexual assault in Sweden, and winds up taking asylum at the Ecuadorian embassy in London, where's he's been living for nearly five years. Poitras interrupted shooting him to make Citizenfour, and most of Risk's footage comes from that earlier period, although she works to include his and WikiLeak's vexed role in America's 2016 presidential election. Risk takes us closer than we've ever gotten to the enigmatic rebel. We watch him plan strategy with sidekick Sarah Harrison, grow paranoid about being overheard during a woodsy chat, do his daily sit-ups inside the embassy, ponder the nature of political risk and, in a scene that defies satire, get interviewed by Lady Gaga who asks inane questions while filming him. Of course, it's part of today's culture that Assange, and even Poitras, should have become pop figures, with Benedict Cumberbatch playing him in a Hollywood movie and Homeland doing an unflattering riff on her. Yet, the Assange we meet in Risk is no caricature. He's brainy, thoughtful, unafraid and elusive, with unsettling white hair and an air of righteous certainty, although he comes off softer and less stentorian than you expect — more Paul Dano than Cumberbatch. The Assange we meet in Risk is not especially sympathetic. Take those sexual assault charges. You'd don't need to be a cynic to think it quite possible that the accusations against him could have a political motive — to discredit him and WikiLeaks. Yet when Poitras shows him talking to his female lawyer about the case, Assange says such creepy things about radical feminist conspiracies that you believe he could be guilty. Things are equally murky when it comes to knowing precisely what Assange believes in. He insists that his feelings don't matter — that what counts are his actions — but his underlying politics are a subject I wish Poitras had pushed him on. Assange clearly believes that the world's power elite maintains control by doing things the public never gets to see. By leaking documents, he thinks, WikiLeaks is revealing how the world actually works — for instance, how Democratic National Committee big shots actually were conspiring to help Hillary Clinton beat Bernie Sanders. Yet here's the problem. Just as most of us don't want our government secretly hoarding people's private information, we also don't want the release of sensitive documents to be controlled by a handful of leakers who answer to no one. In last year's election, WikiLeaks didn't just leak things to damage Clinton — whom Assange considered a personal threat. The leaks failed to redact personal info about Clinton donors, like credit-card numbers, a violation of privacy called out by Snowden himself, though ignored by Poitras. I don't trust Assange or any other unvetted source — and there will be more — to decide which documents from Russian hackers or NSA leakers get put on the web. At one point in Risk, Poitras tells us she's surprised that Assange trusts her with so much access because he doesn't seem to like her. I suspect the truth is she doesn't much like him, which helps explain why Risk lacks the rousing neatness of Citizenfour. She defends him, but can't quite make him a hero. Risk reminds us that grand ideals are finally no grander than the flawed human beings who bring them to life. Like Assange, Poitras believes in making secrets public and abhors this country's draconian treatment of whistle-blowers and its increasing threats against journalists. They're on the same team, and they share the same grand ideal of transparency. But whether or not it was Poitras' intention, Risk reminds us that grand ideals are finally no grander than the flawed human beings who bring them to life.